When teleporting an entity using the /tp or the /teleport command, its Motion is reset to Motion:[0.0d,0.0d,0.0d]. 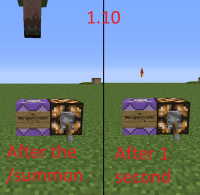 The Zombie should be teleported one block further, then go down because of the gravity, then be teleported again, then go down, etc. The zombie was going in straight line without going down. 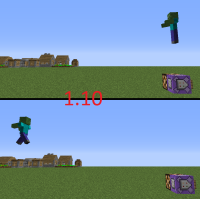 It is the same if the zombie has a levitation effect, it won't go up because the teleportation resets its Motion. 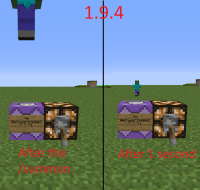 MC-123926 "/teleport" still cancel out motion of mob.